I’m finding the Rewilding Challenge to be a very druidic exercise. It teaches you to see, not just look, and to learn from what you see. The variety to be found in the exercises and the short time given to each of them makes it all manageable, and leaves you wanting more of the ones you like. It’s sort of a sampler platter for awareness as seen through the wild world around us. I don’t get to a truly wild place very often, so I did more than one exercise that day and revisited some as well. Spending thirty minutes looking at a two foot square of ground was very rewarding. Praying mantises are the Tyrannosaurus Rex of the insect world and this one definitely dominated the experience. I watched it catch and consume a ladybug, and when it caught me photographing it it stood up high and proud and threatened me, waving its arms in challenge. Even mantises have something to fear, however, and except for then, it confined itself the the undersides of leaves or within the shelter of the grass stems. Birds probably find them quite tasty. 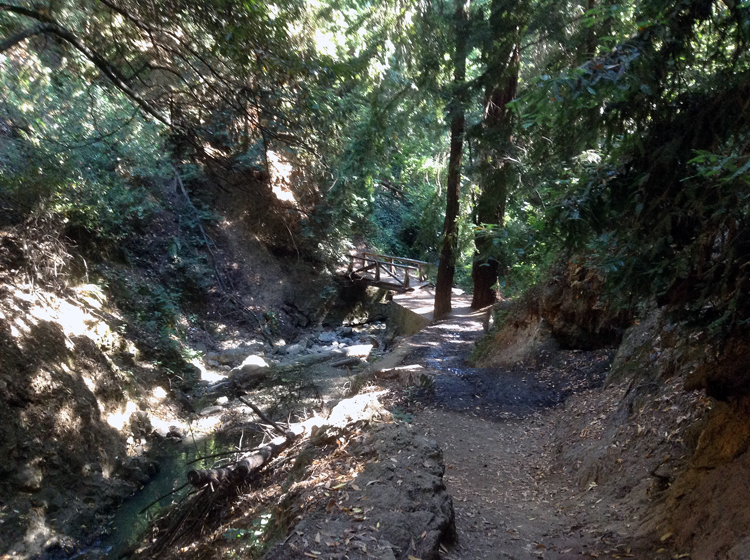 There’s an old growth redwood in the area I chose, and I’ve been looking for it ever since I’ve known it was there. 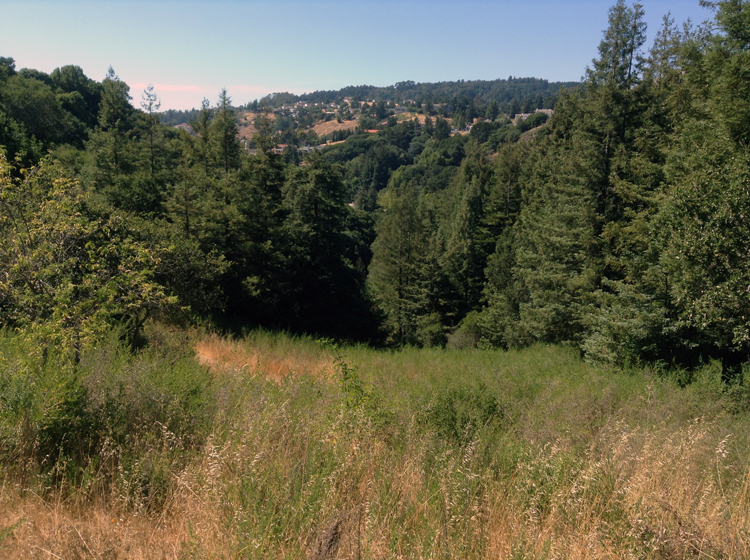 I didn’t find it today either, but I did get a chance to explore the hillsides. 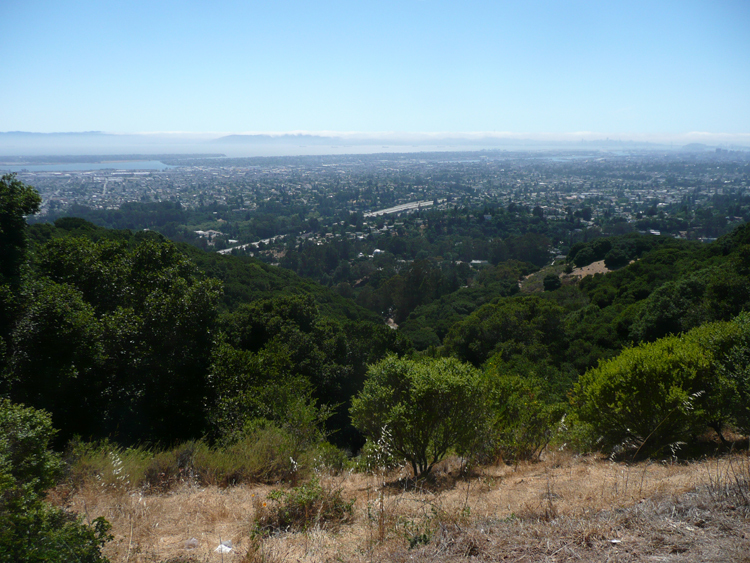 This is the view from the East Bay Hills. I ran across a hillside guardian. Technically no one is supposed to camp there, but this person’s site was clean and well kept, and we were on the same page almost immediately about the trash everywhere (we take what we can out with us and leave none) and the value of having a mental map of the area. It was nice to see someone living with the land like that. I found the other thing I was looking for, though, the entrance to the trail that runs from the bottom of the stream to the top. I’d gone all the way up it once, but never down, and I knew the upper entrance wasn’t marked. This is a good thing, as the tagging and garbage stop well down from the top of the trail because people don’t know where it is. 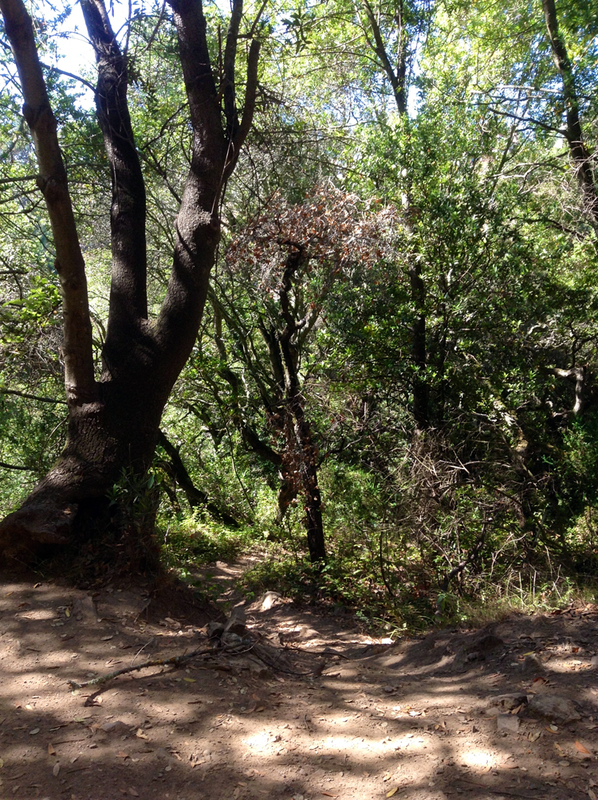 This place is one of the few truly wild places easily accessible by the city bus system, and it’s frankly easier to take the bus to the top of the hill and walk down than to do it the other way around. It was great to see it end to end from the top. I even got fed, and got a chance to take a pair of pix I’d wanted to blog for a long time. 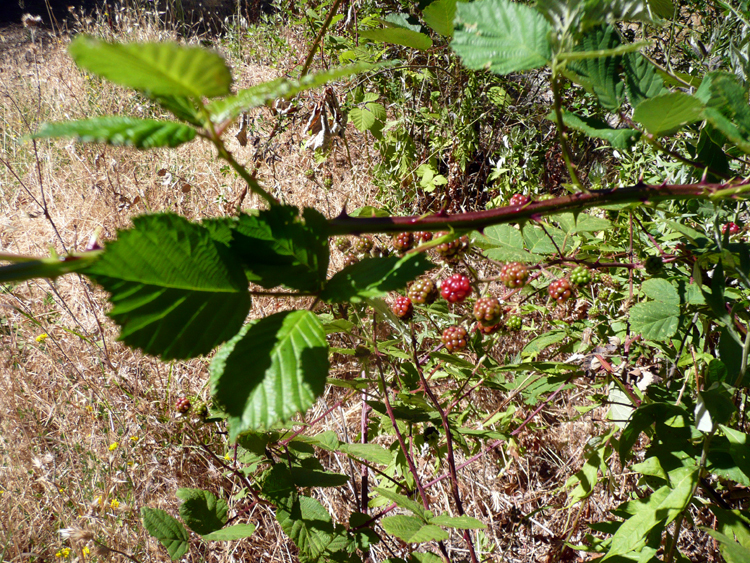 A Druid of my acquaintance taught me the difference between a Himalayan (British species) blackberry and the native California kind. Only the Himalayans are fruiting up there right now, but they were delicious as always The difference between the two is in the leaves and spines. 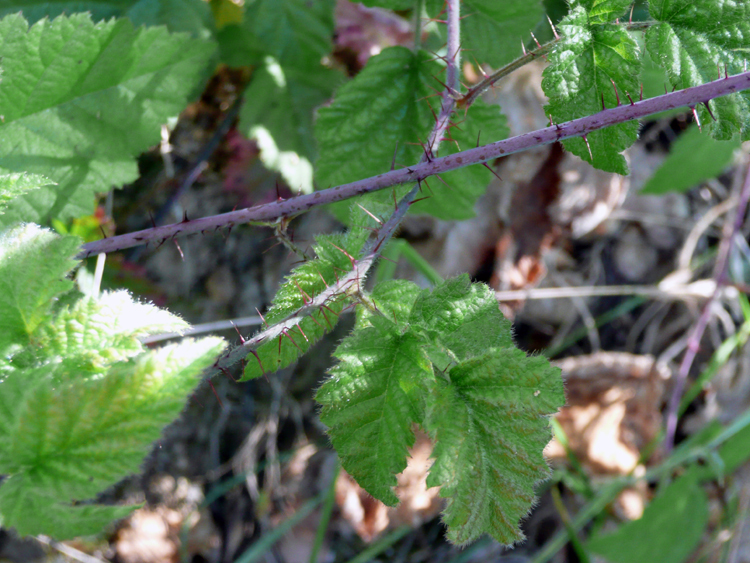 Himalayans have five rounded leaves and thick sharp thorns. Native berries have three leaves, pointed and more crumpled than the Himalayas and their thorns are hairlike and there are lots more of them. What are your wild places? How do you get to them? Why do you go to them? What do they teach you? I miss mantises. There were several different types where I was staying before but I haven’t found any now. No bees either… it’s unsettling, especially since it’s human-generated. 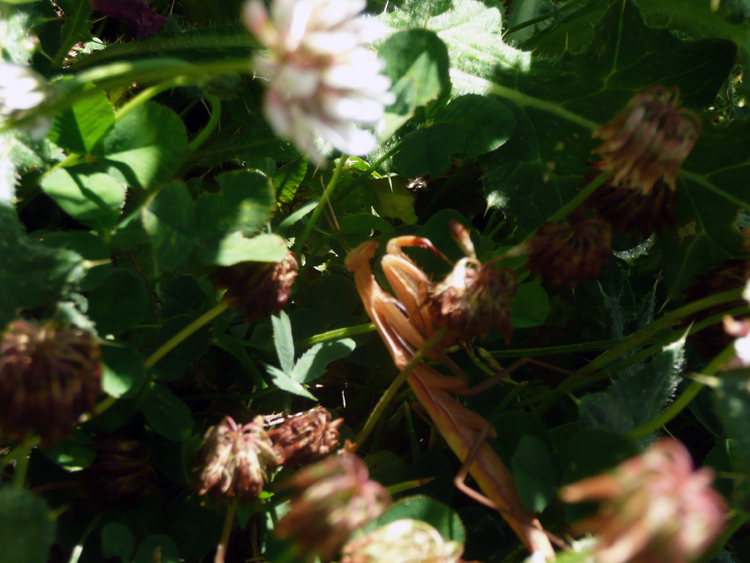 II haven’t seen a mantis in a long time. Merritt College has a really interesting garden, they teach permaculture up there. I felt really lucky to have that little guy in the space I found to observe.